Co-directors Clara Pais and Daniel Fawcett will be debuting their new feature film, Savage Witches, at the Cambridge Film Festival. 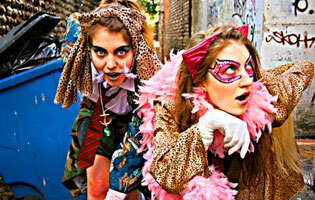 The film tells the story of two teenage girls who like to dress up and go on adventures. Their dreams of fun and freedom really come to life when they find a magic key that unlocks the entire concept of reality and they must decide truly what it is they want in their lives. Savage Witches was born out of our love for the art of Cinema and a desire to make a film in which we felt creatively free, cinema as exploration as opposed to making a product from a set of pre-determined designs. We started with a few fixed points which we knew would remain and we protected these so as not to lose sight of our purpose. One was that the film would follow the narrative of ideas over story or plot – we wanted to be able to move freely between images and moments without being restricted by what would be believable or even acceptable to convention. The other was that this exploration of freedom would use and respond to the people and situations that we encounter throughout production – we would explore obstacles, accidents and inspirations in equal measure and let these become a source of material for the film. Even though we started with a script, which served as a rough map of the territory we wished to explore, it was quickly abandoned – a map can only serve as a starting point for this kind of adventure and conveys little of the reality of being out in the wilderness. Savage Witches is a colourful collage of sounds and images that has been created using all manner of processes and formats from VHS and Super 8 to drawn animation and hand-coloured frames, resulting in a bold and expressionistic exploration of the art of cinema.